As floodwaters recede in central Texas and Oklahoma, residents begin to pick up the pieces and take account of what was lost. The Memorial Day storm brought tornadoes, torrential downpours and severe flooding that left at least 10 people dead and at least a dozen missing, NPR News reported on Tuesday. In Ciudad Acuña, a Mexican border-city of about 140,000 just west of San Antonio, a tornado leveled blocks of buildings on Monday and killed at least 13 people, according to New York Times reports. In Wimberley, Texas, 38 miles outside Austin, a 44-foot surge sped down the Blanco River late Sunday, demolishing homes and businesses, Hays County Commissioner Will Conley told USA Today. The surge set a new record, blasting past a 1926 record of 32 feet. "It was literally a large wall of water that came down the Blanco River and destroyed everything in its path," Conley to told the paper on Tuesday. President Barack Obama signed disaster declarations for affected areas in Oklahoma and Texas, including sections of Houston and Austin. Despite floods, water restrictions are still in effect in the Austin area, reports local NPR affiliate KUT News. Like California and much of the Southwest, Texas is in the midst of prolonged drought. "Before this most recent round of rains, the lakes were 39 percent full, combined. Now, they're 55 percent full," the station reported on Tuesday. “In terms of managing the drought, it’s very wet out in the Hill Country right now, but we’ve been very, very dry for a number of years, and it will take some time and several cycles of this activity to fully replenish our supplies," the Lower Colorado River Authority's vice president for water, John Hoffman, told KUT News. Current water restrictions, imposed when the lakes' combined storage dropped below 45 percent, include one-day-per-week watering, a ban on car washing at home and a requirement that restaurants not serve customers water unless they ask for it, the station reported. Late Monday night, the Austin Statesman reported that 10 Austin treatment plants reported wastewater spills due to flooding. "City officials had no estimation of how much wastewater overflowed but said that the threat to public health should be small because any wastewater would be extensively diluted by flood waters," the paper reported. But officials have advised residents within a half mile of an affected plant to distill or boil their tap water before drinking it. We don't want to fall into the trap of saying every major weather event is related to climate change. But if you trust climate science, as documented by organizations like the Intergovernmental Panel on Climate Change (IPCC) and the National Wildlife Federation, it doesn't really matter whether this particular flood was caused by climate change or not. The fact remains that both of these organizations, and others, warn that we should be prepared for more severe weather events in the future. 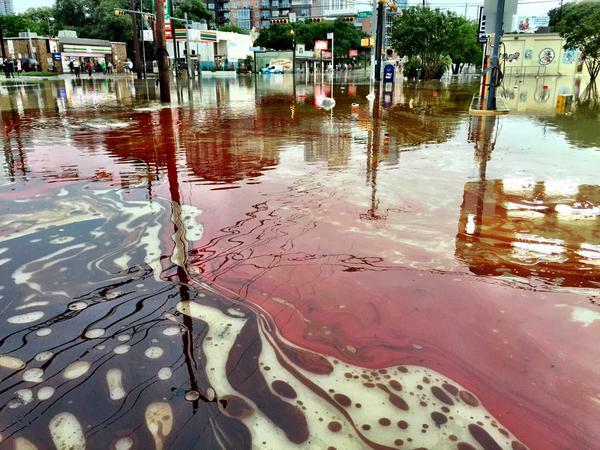 And unintended consequences -- like Austin's wastewater spills and mysterious oil slicks -- pose a grim reminder of the environmental risks that come with a failure to do so. Austin is in the process of a resilience project to supplement local storm water systems and reduce flooding in the city's core. The 1.5-mile Waller Creek Tunnel was slated for completion in March, but poor weather and construction setbacks delayed the project, local NBC affiliate KXAN reported. The tunnel was still not complete when the storms hit on Monday, but Austin residents may rest easier knowing the effects of the next storm may be less severe. Cities across the U.S. face similar storm water management issues, which can worsen flooding and unintended consequences like wastewater spills. Wastewater and storm water systems are outdated in many older cities across the Northeast and Midwest -- leading to a seriously gross phenomenon called combined sewage overflow, when both storm water and untreated wastewater discharge into local rivers due to extreme demand on drainage systems. Out West, prolonged droughts followed by heavy rains inhibit the soil's ability to absorb water, leaving city storm water systems inundated with runoff. As extreme weather and natural disasters continue to overtake our newsfeeds at a rapid clip, one thing is for certain: With a warming climate and an uncertain future, resilience will only become more important for communities around the world.